The Arts and Crafts house design movement began in Britain in the late 1800s. The ornate opulence of the Victorian period paired with the dehumanization of the Industrial Revolution prompted William Morris, an artist, poet, and social reformer, to fight for a return to hand-hewn craftsmanship. He favored simplicity, good craftsmanship and good design (Cummings, 2007). The movement in America was led by Gustav Stickley. Gustav Stickley owned a furniture company in New York, and was influenced by British reformers such as William Morris. He published an illustrated monthly magazine called, “The Craftsman” from 1901 to 1916 that promoted the ideals of the Arts and Crafts architecture movement in America. His book, Craftsman Homes (1909), is a collection of designs from the periodical. There are architectural drawings, descriptions on construction techniques, furniture designs, and more for dozens of craftsman style homes. These ideals inspired a young Frank Lloyd Wright who used these principles to found the Prairie Style. Arts and Crafts house plans, in all their variety, do share some common characteristics. Exposed rafters, beams, or rafter ends are common. Dormer windows in a variety of styles protect glass and create a welcoming entry. Typically, the foundations are constructed of rock, sloping outward as they get closer to the ground. Exteriors are wood or stone with masonry chimneys, and oftentimes have large porches along the front of the home. Interior trim work emphasizes wood grains and built-in cabinetry. The beautifully simple, functional, rustic, and hand-hewn look of this home style appeals to many. In America, regional representations of the Arts and Crafts emerged. The emphasis on local crafts paired with the diversity in climate and culture across America created a variety of styles. Prairie School - In the early 1900s, Frank Lloyd Wright began designing homes to connect with their natural environment. He designed homes influenced by the long, straight horizons and flat lines in the prairie. His designs would not only include the home itself but also the furniture and textiles. California Mission - The mission style was based on simple adobe mission churches, and incorporated the American Arts and Crafts hand-hewn emphasis on emphasizing form and natural woods. 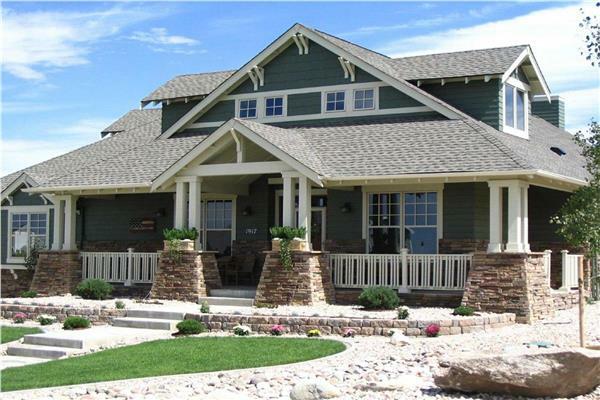 Bungalow Style - The Bungalow Style was one of the first steps toward the modern Ranch home (Stermitz, 2007). The house has a horizontal layout without space for servants. The kitchen was functional and the hearth was designed to be the center of the home. American Foursquare - This practical, boxy, two-and-a-half story home usually had four rooms to a floor and a large front porch (Wikipedia Contributors, 2007). The shape was intended to sit comfortably on small urban lots. Built in cabinetry and Craftsman style woodwork were common. If you’re interested in Arts and Crafts floor plans, we have a wide variety to choose from. Browse through the home designs below, and reach out to our support team if you have any questions about any of the plans.